Ever wonder what a bird’s eye view of Penang is like? The Rainbow Skywalk and Observatory Deck offer stunning seamless views of George Town and beyond. Located at George Town’s highest point, the open-air Rainbow Skywalk is at Level 68, on the rooftop of Komtar tower, offering visitors the thrilling experience of walking on air 249m above ground. Meanwhile the air-conditioned Observatory Deck at Level 65 also features a glass walkway that lets you watch the world go by below. Beside the views, visitors can find double rainbows that arch into a pot of gold, a horseshoe chair and a unique hanging musical orchestra. Also on the rooftop, Coco Cabana Bar & Bistro offers great tapas food and cocktails as well as a great view. Enjoy the feeling of being on the top of the world. This ticket is valid for 1 year from the date of purchase. 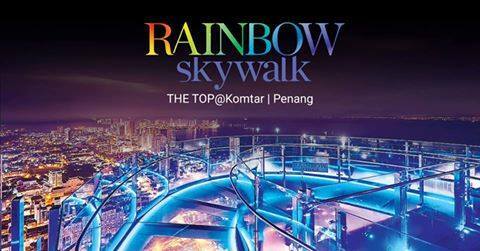 The ticket is valid for the Window of THE TOP attraction, encompassing the Observatory Deck and Rainbow Skywalkat THE [email protected], Penang (Levels 65 and 68) with no time limitation within the same day of ticket purchase. Child rates apply to those measuring from 90cm to 130cm tall; some rides & attractions required parental guide. Adult rates apply to those measuring above 130cm tall. Operating hours are from 10am to 10pm daily. Access to the attraction is subject to weather conditions & availability. There will be no refunds due to inclement weather or any other circumstances. This does not affect your statutory rights as a customer. All tickets remain the property of Magnificent Empire Sdn Bhd and can be withdrawn at any time. MESB reserves the right to vary these terms & conditions from time to time without prior notice. Price is quoted in Ringgit Malaysia, and is inclusive of 6% GST.